One of the many problems I have with courtroom dramas (let me count the ways! and I probably will, as time goes along) is that they ignore court reporters. They're there, taking notes, saying nothing, and vanish whenever anything happens. And yet they're a pivotal, important part of any court. Now, I admit I don't know how it's done in New York City, but in smaller cities and rural areas, every judge has his/her own personal court reporter. These are long-lasting relationships - some for decades. Always symbiotic; sometimes strange; usually very professional; sometimes not; and once in a while the kind to make any court administrator wake up in a cold sweat, with the words "sexual harassment law suit" running through their minds. And court reporters are human beings, too: I remember one court reporter who started dating one of the witnesses, surreptitiously, who later turned out to be heavily involved with the drug-dealing defendant. That got wild and wooly: the court reporter got shot one night, and the only reason the court reporter wasn't fired was that the judge used all of his considerable clout to prevent it. Judges will use their clout to protect their court reporter, because one of the worst things that can happen to a judge, other than being caught in a motel room with a minor the day before elections, is to lose their court reporter of long-standing. This is hell for a couple of reasons: (1) most judges depend on the court reporter to keep track of everything for them and (2) they're going to have to break in a new court reporter, and no one - let me repeat, NO ONE - wants to be around while that's going on. (http://www.stus.com/stus-cartoon.php?name=Court+Reporter&cartoon=blg5807) There's also the problem of getting transcripts, but we'll get to that in a minute. It's the court reporter who makes sure that the judge's life runs smoothly. First of all, he/she keeps the judge's calendar. That's a lot of clout right there. You want an early hearing? Or a delay? Does the court reporter like you? Know you from Adam's off ox? Let's just say that any smart attorney keeps in very good with the court reporter. (Note this website about "gifting" - http://promotionholdings.com/legal/court-reporter-gifting-and-lawyer-ethics/ Not that it happens very often, of course.) By the way, when the judge calls everyone into his/her chambers for some reason? The court reporter is there. When the judge goes golfing? Court reporter often goes along. When the judge is in chambers, thinking? The court reporter is the guard dog on the threshold. Other things on a court reporter's plate: making sure the courthouse is set up to the judge’s personal specifications. There's a whole list of things, from proper beverage on - or under - the bench, to the various requirements of life in the judges' chambers. Hint: When the court reporter tells you the judge wants M&Ms or Diet Seven-Up or only blue pens, get it before the fit is pitched. Often the court reporter is also the judge's chauffeur, driving them to and from court (and here in South Dakota, that could be a considerable distance for a traveling judge). Court reporters are also secretaries, valets, servants... There's a wide range of duties. 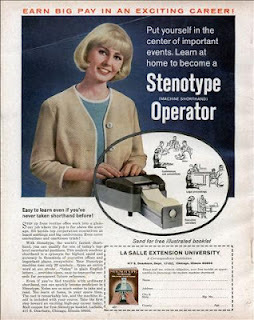 or the old fashioned way (stenotype machine), or the new paperless way. Let's talk for a minute about the records. The old stenotype machines have only gone the way of the dinosaurs fairly recently. They produced a stack of paper, about 3 inches by eternity, on which the transcript is coded; this code is in shorthand, and each court reporter had his/her own shorthand on top of that. It could be very hard for one court reporter to read another court reporter’s notes. (And that wasn't entirely by accident: it's called job security.) In the old days, the court reporter would read the paper tape and type it on a typewriter. Then a computer. And, finally, software was developed that could take those notes and format them into a word processing mode, but, since this requires translation from the shorthand, even this gets tricky. For example, the words “their”, “there”, “they’re” and “the air” are all coded exactly the same. So the court reporter has to both program the software to match his/her shorthand, and also remember what was actually said in the hearing. Sometimes they don’t. Sometimes they're not around because they're retired. Sometimes they're dead. And that's when it gets tricky. Because not all court notes get/got transcribed right away, or soon, or at all. Think of all the hearings and trials that are held every day in every town and city: they don't get transcribed unless they're specifically asked for. Joe Blow pleads guilty to a DUI and gets sentenced to, say, a year's probation and time served . Jill Smith gets caught robbing a casino, and gets 2 years. There's a dispute over the construction of a driveway that goes to trial. (I remember congratulating the judge on his ability to sleep with his eyes open on that one.) There's a jury trial about a possible child abuse case, and the person is acquitted. Or one in which they're found guilty. The paper is there, on tape, on record - but it may or may not ever be transcribed, because the real reason for transcription is a dispute over the verdict. That doesn't always happen. Or at least, not right away. In my days with the circuit court, I remember seeing stacks and stacks and stacks of tapes, dated and semi-labeled, that had never been transcribed, and probably never would be. Wow, that is amazing. How do you know all this? years ago I saw a navy document, i believe it was a training manual for the position of legalman, or something like that, and they weree talking about court reporters who recorded by repeating everything that was said into a cone like microphone. Bizarre. This is great information, Eve. I'm not sure I've EVER seen a court reporter present in a Judge's-chamber discussion, in the movies or on TV. Eve, your post brings it all back. I worked as a court transcriber in the '70s and early '80s. Even at this late date, if I saw stenotype notes by any reporter I'd ever worked with, I could read them back & know who wrote them. I also transcribed Stenomask, which you call the "cone" and we called the "asthma cup". The only good Stenomask reporter I ever knew learned how by watching Perry Mason on TV & repeating everything that was said. Brings back memories of when I worked for the Administrative Law Judges in the Social Security Administration in the 1980s. When I started, the transcribers or what ever they were called used the cone thing to record the hearings. When I left in the late 1990s, they had began using tape recorders. Strange, none of the news stories about the judge here Knoxville who was found guilty of misconduct ever mentioned the court reporter.